CPN-Maoist Centre boss Pushpa Kamal Dahal’s effort to become Prime Minister of Nepal has again received cold water as NC told him that they would not support him to lead the consensus government. His move to topple the present government in the name of forming a consensus government signals his desire to become PM but the latest circumstances show it is not easy for him to become the new PM. 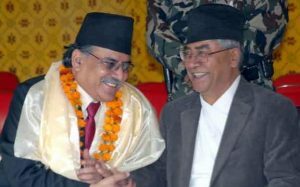 However, Dahal can be the Prime Minister leading a majority government through a coalition between the largest party NC and Maoist Center. It has been clear that formation of a consensus government is impossible now as Nepali Congress outright rejected Dahal’s plan to become a consensus government. NC president Sher Bahadur Deuba clearly told Dahal on Monday that NC could not support Dahal to lead the consensus government. During a meeting Deuba told the Maoist leaders that NC could not support them to form a government. NC has been in favour of forming a majority government under its own leadership and it is susceptible about Dahal as he rejected NC’s offer to lead a new government about one and a half months back. If all goes as planned by Dahal, the present government is likely to collapse soon. The NC leaders have been claiming for the leadership while the Maoists want a new government under Dahal. News reports were rife regarding the divisions of ministries between NC and the Maoists. According to a report carried by the Naya Patrika, a daily close to Maoists, the two parties agreed to let NC lead 12 ministries while the Maoist Centre will have eight portfolios. However, the report is silent about the leadership of the new government. Ruling UML and Maoists got divided when the Maoists accused Prime Minister K P Oli of not abiding by the agreements they inked about 45 days ago which prevented the fall of the Oli-led government. Political analysts claimed that the government will collapse after the Maoists withdraw their support to the present government. There are others who said that UML is likely to prevent the Maoists from forming a new government by supporting the NC to form the next government. The NC and UML formed a coalition government under late Sushil Koirala after 2013 elections and that government promulgated the constitution. While NC did not agree to join the Oli-led government, it looks unlikely that UML will support NC to form the new government. But the UML leaders could do so only to prevent Dahal from becoming the new PM. There are also who said that UML could let Dahal lead the government but it is too impossible as UML cannot support the party which caused the fall of their government. NC that has clearly denied accepting Dahal as PM of consensus government has kept mum about Dahal-led majority government. The NC leaders are against the idea of letting Dahal lead the new government. As such, there is a high chance that Deuba will be the new PM in the support of the Maoists and Madhesi parties.